Figure 2-35. 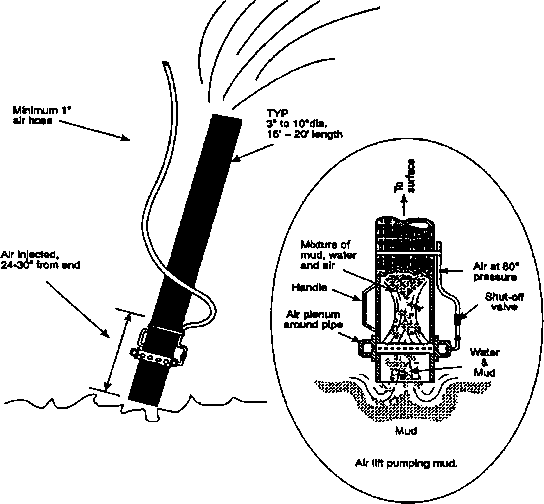 Sample air lift pumping mud. Pipe will buck at start up and if inlet is plugged, diver requires communication with surface. and then submerging the intake end (foot piece) into the seabed material. The seabed material starts to lift almost as soon as the low-density fluid in the discharge pipe rises. Experimentation is usually required to determine the volume of air necessary for maximum eiilciency. the air pressure supplied is relatively unimportant, but it must be at least greater than the pressure at the depth of water in which the excavation is being performed. The air lift can be from 10 to 70 feet long, but it is inefficient in lengths of less than 30 feet. Although it can be used in shallow waters, it is better to use the underwater dredge, described in Section 2.6.3, in water depths less than 16 to 18 feet. The discharge end of the air lift should be kept as close to the surface as possible to avoid reducing efficiency. The air lift has the disadvantage of discharging the lifted material relatively close to the intake point. This may result in some of the material settling back into the excavated area. The discharge should be positioned down current to allow the prevailing currents to carry the material away. CAUTION Divers operating the air lift should use caution around the inlet to avoid the effect of suction and stay clear of the area under the discharge end where heavy objects are ejected. Jetting is useful for moving seabed soils for the burial of cables and pipelines and for installing instrument tubes and structural piles. Jetting is done by supplying pressurized water from a pump mounted on a surface-support platform. A variety of jetting mandrels and nozzles can be used, depending on the work to be done and the flow characteristics desired, such as width of jet and jet velocity. In the simplest form of jetting, vast quantities of mud, sand, or silt can be moved by directing a high-velocity water stream, through a jet nozzle, at the material to be moved. The diver using the jet will have to provide resistance to the back thrust from the jet nozzle. Commercial nozzles are available that have balancing jets that reduce or eliminate the back thrust (Figure 236). A pump with a flow rate of about 100 gpm and a discharge pressure of between 50 and 150 psi over bottom pressure is adequate for this type of jetting operation. When there is a large mound of material to be moved, the diver should start at the top of the mound and wash it away, rather than starting at the base and digging a hole into it. A good procedure is to play the jet on to the objective in short, sharp bursts, in between raising the jet above the work area and directing it horizontally. In this way the disturbed material will be moved away from the area by water from the nozzle and the visibility will remain quite good in the work area. This type of jetting is efficient if there is a fairly strong current to carry the disturbed material away from the excavation area. The diver should be positioned upstream of the current. • The first technique involves using large jets to erode and displace the seabed soil to leave an open trench. This method works well in many slightly or moderately consolidated cohesive soils (mud) as well as in some noncohesive (sandy) materials. The cable or pipeline to be buried is laid on the seafloor along the planned route. The jetted trench is then excavated either beneath or beside the cable or pipeline. The cable then either settles into place or is placed in the bottom of the trench. sive) that have a flat natural slope (angle of repose). These conditions ordinarily would require removing large volumes of material. Many small jets are mounted on the leading edge of a plow-like stinger. The small jets erode and suspend the sand in front of the stinger. The cable to be buried is fed into the jetting area by a guide chute. The reduced density of the sandy soil allows the cable or pipeline to fall and become buried. The pump used for the fluid-ization jetting operation should have a flow rate of at least 500 gpm at a pressure of about 100 to 150 psi. See Sections 5.2 and 5.3 for more discussion of burial by jetting. 2.6.2.2 Vertical Instrument Tube Installation. Jetting can be used for installing vertical or near vertical instrument tubes, such as those required in shallow water arrays. To maintain the required orientation, instrument tubes are typically installed using a jetting stand. The jetting stand is placed over the location, and the instrument tube, with the jetting mandrel placed inside, is lowered by crane. The installation is directed by divers using two-way communication. With the mandrel in place, the water jet is turned on and the soil under the instrument tube is displaced. This allows the tube to fall. When the tube reaches the desired depth, the water jet is turned off. The jetting mandrel is removed and the stand is moved to the next location. 2.6.2.3 Structural Pile Installation. Jetting can be used for installing structural piles. Reinforced concrete piles may have a jet pipe built into the center of the pile. The water pump hose is connected to the top of the pile and the opening at the bottom of the pile tip serves as the nozzle. For all types of piles, a jet pipe is placed alongside the pile, with the tip of the pipe slightly below the bottom of the pile. The pile and jet pipe are lowered together as the jet displaces the soil below the pile. Usually the jet is removed before the pile reaches the specified penetration, and a hammer is used to drive the pile the final 5 feet or so to ensure that it has adequate bearing capacity. 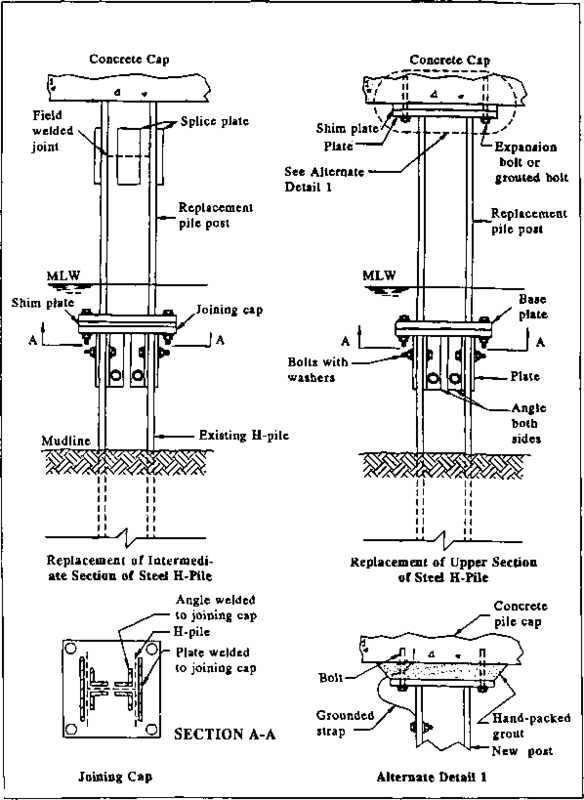 This method of pile installation is only effective in noncohesive (sandy) soils. Underwater dredging is a useful technique for moving large quantities of soft seabed material where the water is too shallow for an air lift to be effective and where the material does not have to be lifted too far above the intake point. Figure 2-37 illustrates two underwater dredge arrangements. One system uses an eductor tube or pipe with a 30-degree bend near the intake end. At the center of the bend a water jet is connected. The water jet is aimed toward the discharge along the centerline of the main pipe. The jet moves the water in the pipe and creates a suction at the intake. The nozzle suction is created by the venturi principle and the height of the lift attained depends on the size of the pipe and the output of the pump. A 200-gpm pump with a 6-inch pipe will lift as high as 60 feet above the seabed. When operating only a few feet above die seabed this same system can move as much as 10 yd3 of loose gravel, mud, and sand per hour. Table 2-17 lists typical suction pipe, jet pipe, and pump sizes. Commercial eductor nozzles such as the gold dredge are listed in Appendix A. 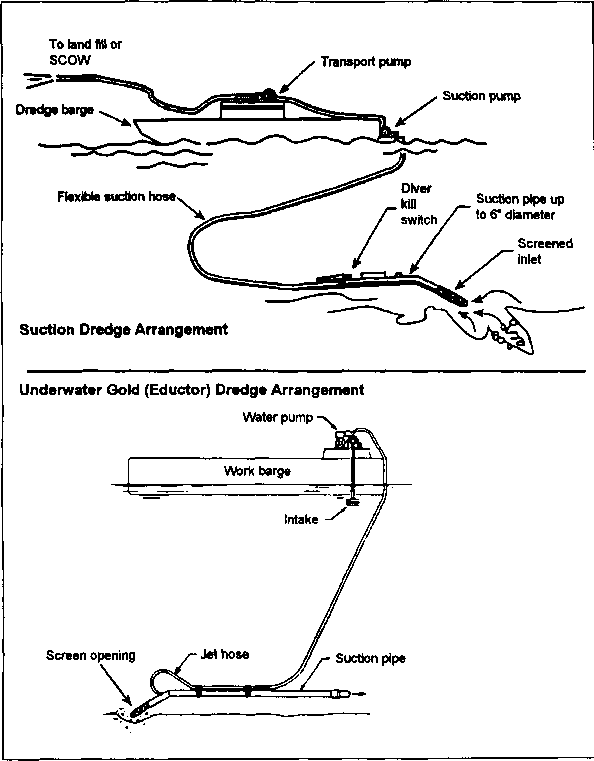 Underwater suction dredge and gold (eductor) dredge arrangements. How does underwater suction pipe works? How does a SUCTIONPIPE WORK? What is more effective suction for water jetting? How to make air lift underwater? How does a suction pile work? How to built a under water air lift? How does a pump suction pipe works? How a suction dredge works? How to create an air suction in a water line? How to move underwater sand?